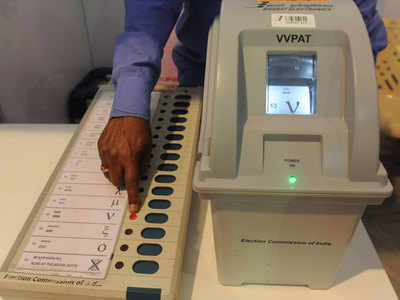 After a cyber expert claimed in London that the 2014 Lok Sabha elections were rigged by hacking the electronic voting machines (EVMs), clamour has been rising in the country with many Opposition leaders asking the Election Commission of India (ECI) to revert to the system of ballot paper for recording votes of the electorates in polls. Hacker Syed Shuja also alleged that journalist Gauri Lankesh (above) had been murdered to prevent her from revealing the conspiracy, but offered no evidence. Shuja, who said he is seeking political asylum in the USA, claimed the telecom giant Reliance Jio helped the BJP to get low-frequency signals to hack the EVMs. TOI had on Monday reported that EC would register a criminal case under Section 505 of IPC and that enquiries by EC with ECIL had ruled out Shuja being its regular employee or on the EVM design team. "Nobody turned up for such demonstrations". However, he provided no proof to back up his claim. "He was not credible and should not have been given a platform". Quite frankly, the scale of the operation that Shuja claims was and is still going on, and the tools required for it, would be virtually impossible for the BJP, or any other private entity, to obtain - that too, in the run-up to an election year when they were not even in power. He was presented at the press conference held under the aegis of the Indian Journalists' Association (Europe). "Not one of the masked speaker's accusations have so far been corroborated", it tweeted. "Insanity in the Congress party is increasingly becoming contagious", said the Minister, who is in the United States for medical check up. "Is the Congress sponsored event created to insult the popular mandate of 2014?" The Election Commission (EC) has also rubbished his claims and filed a police complaint with Delhi Police on Tuesday. Dr Rajat Moona, the top technical expert with the Commission, had told NDTV that EVMs are "stand-alone machines which have absolutely no capability of transmitting or receiving any data through any wireless communication of any sort", which is why they are "tamper proof". The statement went on to reiterate that the ECI exercised "rigorous Standard Operating Procedures" during the manufacturing of EVMs. On his part, Sibal said, "There should be an inquiry in the charges Shuja has made". Says Shekhar Gupta, condemning the irresponsible press meet, "This EVM presser isn't just underwhelming, it is insulting to anybody not smoking illegal stuff. If they are right, then it is a very serious thing". "He sent me a personal e-mail also". He said he had received an invite from Ashish Ray.